Logitech diNovo Mini Is A Perfect Fit For Any HTPC | OhGizmo! How many of you own HTPCs? I’ve owned one in the past, but since I can now watch DivX movies on my Xbox 360, I’ve since decided to decommission it. When I did use a PC in my living room, there was always the hassle of having a keyboard and mouse lying around. It wasn’t too awful, as I had a Gyration set that was small, wireless and easy to use. However, Logitech’s new diNovo Mini looks like the perfect keyboard/mouse solution. The mini-keyboard has all of the essentials that you’ll need. 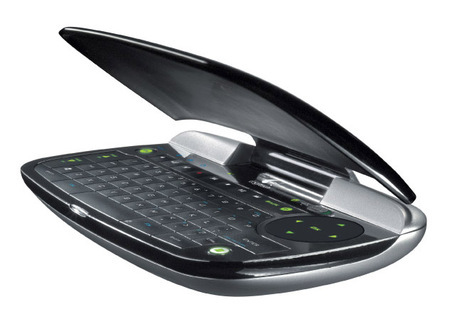 The full QWERTY keyboard reminds me of the one on on my old Cingular 8125 (and likely that of my HTC Mogul that should be showing up on my doorstep any time) which should be comfortable enough for what little typing is necessary. The best part has to be the small integrated ClickPad which serves as both a trackpad and directional pad. It communicates with your PC via Bluetooth and will run for around a month on Li-ion batteries. Look for it to hit stores later this month for around $150. But does it work with a mac? Would absolutely rule for the MacMini tied to the TV (or a hacked AppleTV). btw, I wonder what the cover does… looks like a laptop lid with no screen?